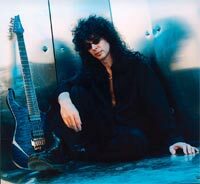 Patrick has used Ibanez RG Prestige guitars exclusively since 1999. 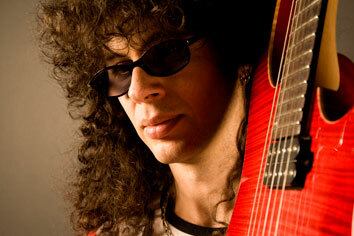 With Elegy he initially used an RG 3120 and a 6207 for the recording of “Forbidden Fruit”. 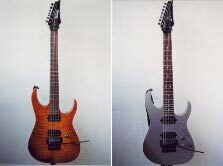 Two new Ibanez custom guitars were used by Patrick in Greece for the JM Jarre concert (2000). One custom Prestige RG is blue. Two pickups A Zone and a humbucker from hell. The volume knob is slightly lower than on the 3120, not to interfere with the right hand while remaining easily accessible. Patrick initially wanted to remove the tone knob on future models. But during rehearsals with JM Jarre this control became absolutely essential when an E Bow was used. The guitar was personalized with two frogs on the fret twelfth, as well as being a specific blue colour. It has a Piezo transducer on the tremolo bridge and two volume knobs, one for the electric out and the other for the acoustic out. There is a single tone knob for the electric one only. There is also a switch to control both outputs on the guitar. You can place both on the same switch. Or, if needed, you can connect the electric out to a classic amp and the Piezo out directly to the PA to obtain a quasi acoustic sound with this sole switch. The third version " transparent black " came with a Piezo but also with a 3-position switch (2 on the red one) allowing use of the Piezo alone or both together. 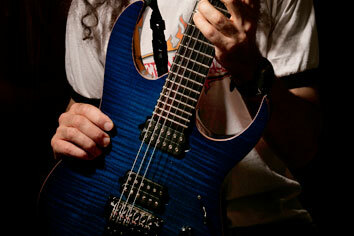 This new model was delivered with the new vibrato Ibanez edge pro. Ibanez RGT 3020 neck through body.